The future of recruiting has a lot of different facets and they are all constantly evolving. We are going to break down the six trending topics we think are going to play an increasingly important role in recruiting. And we’ve included a few tips to help you to get started! AI is a topic of conversation in the future of almost every field, recruiting included. Chatbots have become a hot topic with many recruiting departments testing them out as a way to interact with potential candidates. Some other aspects of AI are automation and analytics, which we will discuss more specifically below. Our tip: While AI can absolutely be beneficial to the recruiting process, take the time to assess whether or not a chatbot is necessary in your case. Automation will continue to shape recruiting, particularly as automation technology continues to develop. Right now, one of the key elements is candidate nurturing via email automation. For example, you can stay in touch with candidates through sending automated nurturing emails, like a welcome email to your talent pool or a monthly newsletter. Or use automated emails to make sure each application receives an immediate response, so that a candidate doesn’t have to worry whether or not you’ve received their documents. 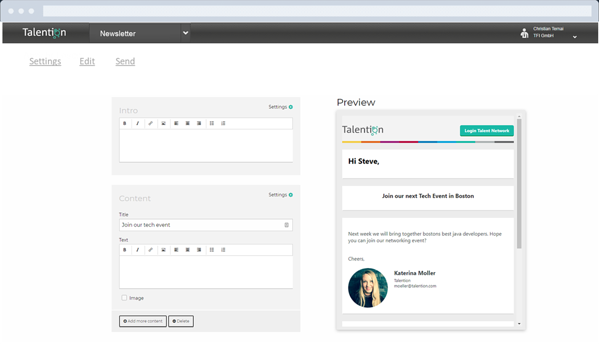 Our tip: Use automation as a way to improve candidate experience throughout the recruiting process. Today a large part of the recruiting process takes place online. 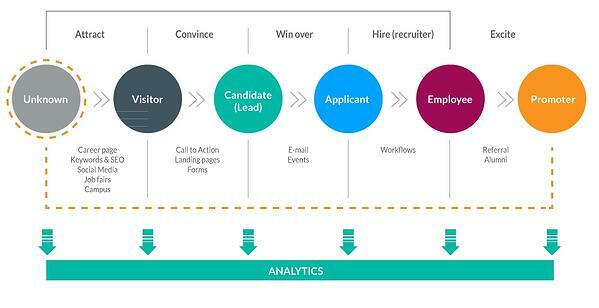 Analytics are helping recruiters to shape this process and make it more intuitive and efficient. For example, analytics can help you to determine where you are losing candidates and if you are even reaching your target group. They can show you your most effective channel and help you to maximize your budget. 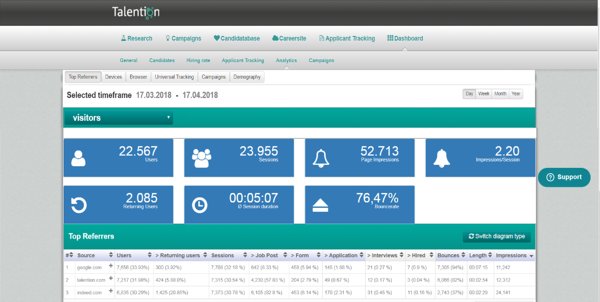 Our tip: By using a recruiting software with analytics, you can get a comprehensive overview of all of your data at the click of a button. Agile recruiting is all about making recruiting processes faster, more efficient, and cheaper, so it’s no wonder that it will remain a focus in the future of recruiting. With agile there is always the possibility to improve your process, so it’s likely to keep evolving especially as modern technology continues to develop. Our tip: To create a more agile recruiting process, focus on adopting a streamlined system where you will have all of your team’s information stored in a comprehensive way. SEO is becoming a critical part of many jobs, from marketing to retail to recruiting. And although SEO strategy is constantly changing, it is absolutely necessary if you want to be able to reach as many candidates as possible. Keyword research and optimizing your job advertisements for SEO are two of the most important things that you can do to ensure that your job ads are found by your target group. Our tip: Using a SEO tool for your job ads will save you time and help you to increase your reach. The classic recruiting model is a thing of the past. In today’s highly competitive war for talent, recruiters have to do more than simply post jobs online and wait for a response. By incorporating marketing strategies, you can ensure that you have a pool of qualified candidates for every position that are excited about your brand. Our tip: If you want to start doing recruitment marketing, consider using a recruitment marketing software to make the transition even easier.